This was a crazy week in my classroom. It was the last 2 days of our official school year, then our extended year program started. There was not a lot of time to really spend a long time on Earth Day (Sunday, April 22 was Earth Day) this year. We did manage to squeeze a few little activities in. 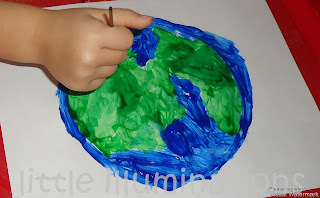 We painted the earth in art center. We took time to care for our garden. It's starting to show signs of growth! We covered large pine cones in lard and sprinkled birdseed all over to make bird feeders. After we made them and let them set for a bit, we took them outside to hang on our trees. In the midst of everything else going on this week, it was also NAEYC's "Week of The Young Child". This year's theme is: "Early years are learning years". While I wasn't able to plan specific activities to go with this special week this year, I think the activities we did do will help shape my little friends into life long learners and lovers of our earth!